Amazing service from Jolita and Aleksander!! 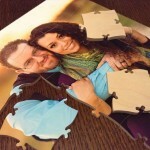 My daughter and son-in-law chose a Lorenzo puzzle as their wedding guest book and it was a great success. It is being mounted and framed for them to keep forever. When we suffered a mishap (our fault), Jolita and ALeksander went above and beyond to make everything right. We are all very grateful to them and can't thank them enough. Amazing is the word to describe the puzzle. Was the first time I order , and went everything nicely from the first e mail . Got my puzzle today and it is absolutely stunning. As I am based close to the Lorenzo puzzle HQ, I enquired to see if I can pick up my puzzle personally when it is finished, instead they said they would drop it off to my address. Aleksander dropped off the puzzle at my door step today with his sweet little girl wishing us a happy marriage! You can't ask for better service! Unique, high quality and beautiful! Me and my finance did not want a generic Guestbook for our wedding day, we wanted something we could keep forever and was a little unique! We found this website, was a little worried it was based in the UK as we live in the US, but the service was amazing! Friendly correspondence, quick delivery and the highest quality puzzle! ORIGINAL IDEA! GREAT SERVICE! GUESTS WILL LOVE IT! I would like to thank you for having sent the puzzle in time for when I needed it (which was only a few days from my order)! This original guestbook was a great success and all the guests were fascinated and enthusiastically participated writing messages on the little puzzle pieces! strongly recommended! great service! I ordered a wedding guestbook puzzle for my sister's wedding as a gift. The puzzle was absolutely beautiful and was a real talking point at the wedding. I cant thank Lorenzo Puzzle enough for providing such a lovely addition to the wedding! a perfect puzzle for our perfect day! Both my fiancé and me are thrilled with our puzzle, if you are in any doubt, please don't hesitate! We have had nothing but friendly and helpful correspondence from Jolita & Aleksander, and when our puzzle arrived (with 2 pens and practice piece of wood!) we couldn't have been happier! Thank you both Jolita & Aleksander for make our wedding day that extra bit special. We spotted this item online and were attracted to the unusual nature of it. It offered a perfect opportunity to capture our guests comments and then display them.We were so pleased with how it turned out and can now display it forever. 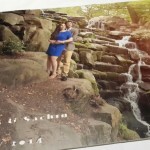 We decided to contact Jolita & Aleksander after seeing their wonderful job. We were looking for a different guestbook puzzle for our wedding, which should be full of meaning to us also. 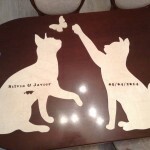 So we asked for 2 cats playing with a butterfly: the cats represent people from Madrid (so we are) and the butterfly represents Panama (land of butterflies), which is the new country we are living in after our wedding. We do not know if we will stay there for a short or long time, but we both know that this puzzle will travel with us anywhere we go, till the end of our journey. Thank you Lorenzo Puzzle! You make dreams come true. 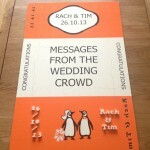 I am absolutely delighted with my puzzle for our wedding day for guests to sign instead of a book! The wood and carvings are beautiful, it came in a lovely box - well wrapped and well presented. The 2 pens provided to write on the wood are fab and I loved the small piece of extra wood for guests to practice on. Ordering it was easy and Jolita & Aleksander were fab - always polite, professional and prompt with any inquiries I had. Would highly recommend Lorenzo Puzzles! 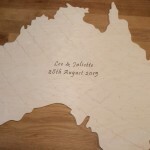 I found Lorenzo Puzzle on the internet and enquired about having a wedding guest book shaped in the shape of Italy due to my fiancée being Italian and also wanting something different. I was a little worried as this isn't something you find everyday. Jolita & Aleksander got straight back to me and said it wasn't a problem. The price was reasonable, they kept in touch throughout it was being made and informed me when it had been sent. It looked amazing and better than we ever imagined. Thank you so much for making our wedding day unique and I would highly recommend you to anyone. This was a great guestbook for our wedding! 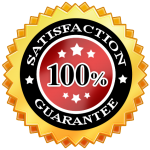 It's clear that there is great pride taken in this product --the quality is phenomenal and the customer service provided was great. Shipping was fast and the puzzle came packaged with great care and very securely. Very much in love with the puzzle and looking forward to displaying it at home. Thank you so, so much! We came across Lorenzo Puzzle a just over a week before our wedding and contacted them fully expecting to be turned away because of the tight deadline. To our surprise and delight they accepted our request to send us a guestbook puzzle under their 'rush' service. We received it a day before we needed to get it to our venue, and we noticed that there was a problem with one of the pieces which wasn't quite what we were expecting. As you would imagine we were in a bit of a panic as we thought we wouldn't be able to display it. However Alexander came to our house (in the pouring rain!) to collect the piece which needed to be changed, took it away so that it could be worked on overnight and dropped the new piece through our letterbox at about 6am the following morning so that we could take the puzzle to the venue. The puzzle itself was absolutely wonderful and got lots of compliments on our wedding day. We have it as a beautiful memento of all of our friends and family who were able to celebrate with us. Perhaps even more impressive though is the fantastic customer service that Jolita & Aleksander provided which we will never forget. We would have no hesitation in recommending Lorenzo puzzle to anyone in future and if there is ever a need to use them again we most certainly will. Our guestbook puzzle is the most beautiful jigsaw we have ever seen, with our themed artwork on one side and all our guests' messages on the other. 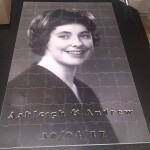 Jolita and Aleksander at Lorenzo Puzzle were so helpful from the moment we got in touch right through until our puzzle was delivered, always eager to work with us and our wishes to produce a stunning puzzle for us to cherish forever. Thank you so much, it is just perfect. From my first email to Lorenzo puzzle, I knew I was in great hands with true artisans! The attention to detail in the clarity of the photo to be used was my first clue that the puzzle guestbook would be a real work of art! And just a few weeks later when our package from Lorenzo puzzle arrived here in Dallas, Texas it was wrapped so graciously, like the treasure that it is! I can't wait for friends and family to sign their words on the amazing, colorful wooden pieces! What an amazing reminder it will be of the wedding celebration in the years to come! We have always loved 1000 piece jigsaw puzzles, solving them on the kitchen table together over a weeks time, so this puzzle guestbook will be extra special to our daughter! I cannot say enough praise of the kind people of Lorenzo Puzzle, Jolita and Aleksander! They are friendly, helpful, talented craftsmen that take great pride in their work. How fortunate I was to find them on the Internet from the Wedding Knot! I will send a photo in December from our daughter's wedding! Thank You Thank You! 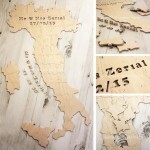 Lorenzo puzzles completed our bespoke wedding puzzle which we are using as our guest book. 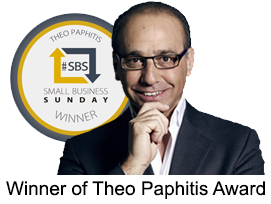 The service we received was fantastic...all queries were answered quickly and they listened to what we wanted. The time between ordering and receiving the puzzle was a matter of weeks. We would definitely recommend to anyone! The folks at Lorenzo Puzzle are amazing! My fiancé and I were down to the wire with finding a Wedding Guestbook alternative. We had been looking at other puzzle-makers online but found that most of them had a 1-2 month turnaround. We needed something in two weeks. 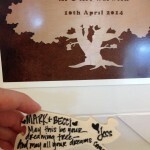 We found Lorenzo Puzzle on Etsy.com and fell in love with their Wedding Tree Guestbook Puzzle. I reached out to Jolita & Aleksander @ Lorenzo who provided me with the custom template that afternoon and assured me that they would be able to have it done in time for our wedding. After providing them with the wedding details, the puzzle was delivered to my office in about a week and half (ahead of the scheduled delivery and I live in North Carolina, USA). Fantastic service, prompt follow-up, beautiful puzzles and they deliver as promised! Thank you Lorenzo Puzzle for helping memorialize our September 2013 wedding day!